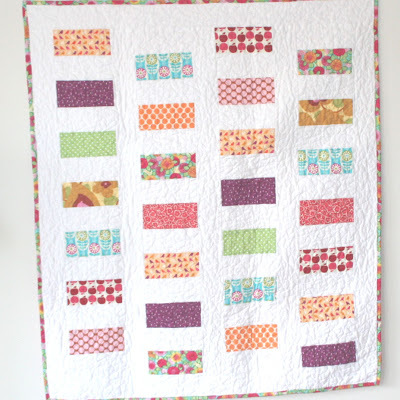 You can view and download the Colorful Coins Quilt Pattern here. This was my project the past day. I made two of these, and they were super easy and only took me like two nap times to whip up. (time is not measured in minutes at my house its measured in Ben’s sleep cycles) I love this quilt because you don’t need a pattern, and you can use your scraps and make them big or small and lots or just a few. Even the quilting went pretty fast, I washed it after I quilted it, it gives it that soft puckered vintage look that I LOVE!!! I want to keep this one for myself and snuggle with it. I just tracked down a store today that will have the right needle for my machine to start quilting. I made a table runner out of Halloween-y scraps yesterday. Today I’m going to invest in some basting spray, buy a peice for the back, and try my luck (again) at a binding. I need practice anyway. I also have some adorable jumpers in mind for my girls I’d like to whip up next week. I’ll post them when I finish! I’m Claudia from Germany, and I love your cute baby quilt! 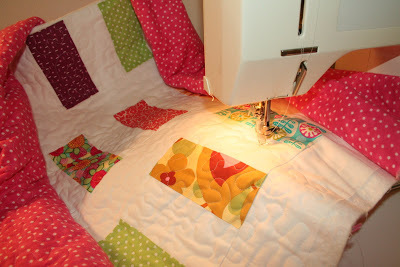 Can you tell me, how large are the scraps in the quilts? So I can make one for my baby too. Thank you. Hi Claudia, you didn’t leave your email so hopefully you see this post! 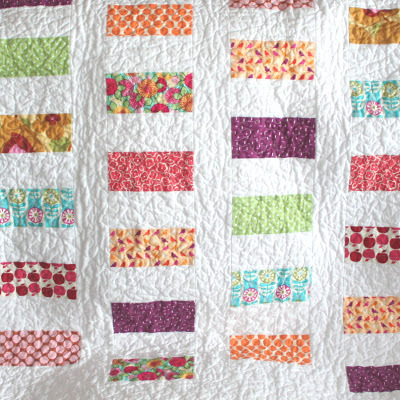 The scrap blocks are 3″x6″, same with the white ones, and then you just sew them together alternating and put a strip in between the rows, easy easy! I know I’m a little late in the game for this pattern but I’m a brand new quilter and this looks like a great easy quilt to try. I’ve not followed a pattern yet so yours would be the first. Thanks so much in advance! This is so perfect. I used red instead of white to match nautical prints for my nephew-on-the-way and I really love how this has turned out. Thanks for your tutorial!